As the nights get longer during the Michigan autumn, motorcyclists must prepare themselves for the dangers that await them if they choose to ride at night. Night riding presents many new risks due to lower visibility. To help prevent motorcycle accidents while riding at night, here are some safety tips, courtesy of the Motorcycle Safety Foundation. 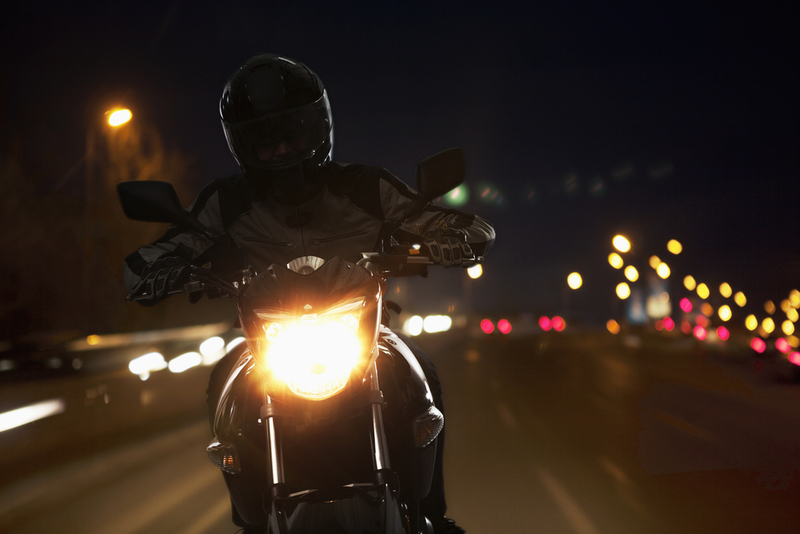 Motorcyclists must ride slower at night than during the day. Cautious riding helps to avoid speed accidents on unfamiliar roads and gives the driver time to detect potential road hazards. However experienced you are, visibility is vital for safety while driving a motorcycle. At night, it’s harder to notice bumps and curves in the street, which may damage your bike and your health. To increase your visibility, wear a reflective vest over your riding gear, and use reflective gear for your motorcycle. Replace the standard OEM bulbs with LEDs for your high beams and add flashers to your brake lighting to better alert others of your presence. Cars’ headlights are better for seeing at night than your bike’s high beams, so be sure to safely follow any vehicles ahead of you to light the way. Also, watch the movement of their brake lights to detect holes or bumps in the road. If you have to ride at night, you should move to the best spot in a lane to give you greater visibility and space. Stay aware of your surroundings so that you have enough time to react in case anything goes wrong on the road. Motorcycles can find themselves in a bad position if a car accident happens, even if the cyclist wasn’t involved. Flying debris and sudden movements can cause someone to lose control of their chopper, leaving them with lasting injuries. Judging distances at night are harder because your motorcycle’s lights distort the natural contrast of light and shadow that help judge distances during daytime hours. You should keep a minimum three-second distance to allow you more space to pass or be passed without incident. Many animals come out onto the roads at night when there is less traffic. If you come across one, avoid hitting it. Try to move around it while making sure not to drive off the road or into oncoming traffic. About 47 percent of all fatal motorcycle accidents while night riding occurred under the influence of drugs and alcohol. If you’re intoxicated, do not operate any motor vehicles. While it’s not required for motorcyclists in Michigan to wear a helmet if they have proper insurance coverage and two years’ experience, it’s still advisable to prevent injury. It’s essential to prepare for night riding, especially as nights are getting longer. But as long as you follow the above tips and be careful, you should be safe. If you have questions or need assistance regarding involvement in a motorcycle accident, don’t hesitate speaking with an experienced motorcycle accident lawyer. At Michigan Legal Center, Christopher Trainor & Associates will assist you along every step of the way in order for you to receive the justice and compensation you deserve. Contact our office at (877) 425-0743 for a free case evaluation.